DIN Standards are invented for a variety of components including industrial fasteners as DIN 607 Round Head Nip Bolts. DIN 607 Bolts are manufactured from Carbon Steel, Stainless Steel Grade A2 or A3, Brass, Alloy Steel, Plain Steel, Ordinary alloy steel or many other materials. 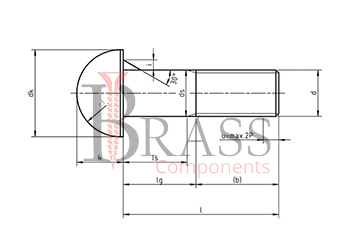 DIN 607 Bolts are available in a wide range of sizes, shapes and materials. DIN 607 Bolts are Round Head Nip Bolts with Nuts and incomplete metric thread. Strength Class 3.6 and 4.6. DIN 607 Bolt with semi-circular head. Can be used in conditions of high humidity or direct contact with water. 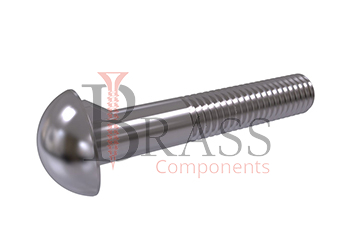 Semi-circular head enhances the appearances of bolt and provides the most durable fixation of bolt. The incomplete Thread prevents the rotation of bolt when used with the nuts. The presence of projection under the head facilitates a stronger fixation of the screw during fastening the elements and parts. Increase the productivity at the final stage of assembly. Used for joining and fastening parts together with nuts. Used in machine building and wooden applications. We manufacture DIN 607 Bolts as per Custom Specification and export in Germany, Sweden, Denmark, Norway, Russia, France and other European Countries.For more Information, Please Contact Us or Inquiry Now.